Last season Dancing with the Stars saw a big drop in the ratings. Will they continue to fall or will this round of contestants turn things around? Stay tuned! Tom Bergeron and Brooke Burke return as hosts and Bruno Tonioli, Carrie Ann Inaba and Len Goodman are still the judges. This time around, the contestants are Elizabeth Berkley Lauren, Corbin Bleu, Brant Daugherty, Bill Engvall, Valerie Harper, Keyshawn Johnson, Christina Milian, Bill Nye, Jack Osbourne, Nicole “Snooki” Polizzi, Leah Remini, and Amber Riley. The ratings are typically the best indication of a show’s likelihood of staying on the air. The higher the ratings (particularly the 18-49 demo), the better the chances for survival. This chart will be updated as new ratings data becomes available — typically Tuesday morning, around 11:30am EST/8:30am PST. Refresh to see the latest. Final season averages: 2.2 rating in the 18-49 demographic with 13.73 million total viewers. Last year comparison: The Monday episodes of the 15th cycle of Dancing with the Stars averaged a 3.3 rating in the 18-49 demographic with 17.56 million total viewers. What do you think? 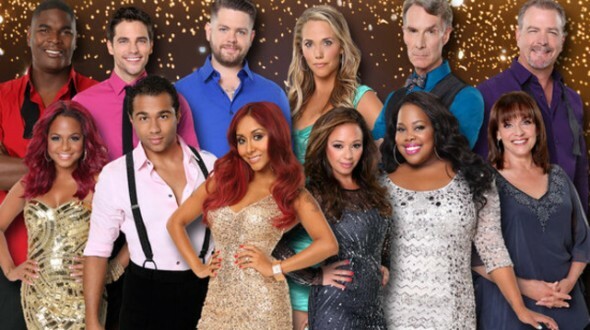 Do you still like the Dancing with the Stars TV series? Do you think it should be cancelled or renewed for a 19th season (next fall)? How is the % Demo Change and % mil change under the season averages calculated? Based on the first three episodes, both should be in the negatives and the average of the 3 % in the demo would be more than 7.71%! How is it all calculated? The season averages are based on this season’s numbers. Those averages are compared to last season’s total averages. For example, all of the Monday episodes last fall averaged a 2.29 in the demo so, at this point, the demo average is up 7.71%. Similar calculation for the viewership. Hope that helps. I do see I accidentally compared the current season opener to the season opener of Fall 2011-12 (4.0 w 19.03 mil) instead of 2012-13 (2.5 w 14.11 mil), I’ve fixed it and doublechecked the other numbers. The other data is still correct and wasn’t impacted. Harold Wheeler (DWTS Band leader) has sent an email to the band letting them know they will NOT be returning next season. Instead, DWTS will use canned music. I can probably think of worse decisions for this show, but not many. Hey, what’s with the 18 – 49 demographic? If we are over 49 you don’t care if we watch? Bad mistake. Agreed. In fact when I was in my salad days I would have been to busy to watch. I thought the show was very good. I like that they did away with the chat at the top of the stairs after then dance. Move it along and don’t run over the two hour limit. None of this ending the show one or two minutes after the hour! That is irritating. Thumbs up on that move! Nothing personal against Elizabeth Berkley and others like her, but perhaps they should reconsider using semi-pro dancers as contestants. If they desire to do this, than maybe they could have a season where all were mostly in the same league. Age grouping might be another opportunity for a new spin.